Raise your hand if you’ve ever heard of Kazaxe. Axe means “positive vibes”, and it is exactly what our whole philosophy at Azuka-Bom is. We want you to have a place where you can feel great and have fun! “CASA DE AXE” = “House of Positive Vibes”. Kazaxe is a party workout! We use international music you can FEEL rush through you. Dancehall, Reggae, Hip Hop, Soca, Samba, Axe, Brazilian Funk, Southern Line dances, even some Tinikling, haha. And we do not widdle waddle around, we get you moving. If you think “dancing” can’t be a hard workout, I say, you should just try. Basically, it’s a super crazy-amazing dance workout. Every time I go, I sweat a ridiculous amount and have so much fun. I mean, just check out this video: https://www.youtube.com/watch?v=aSqGNYpjVxE. 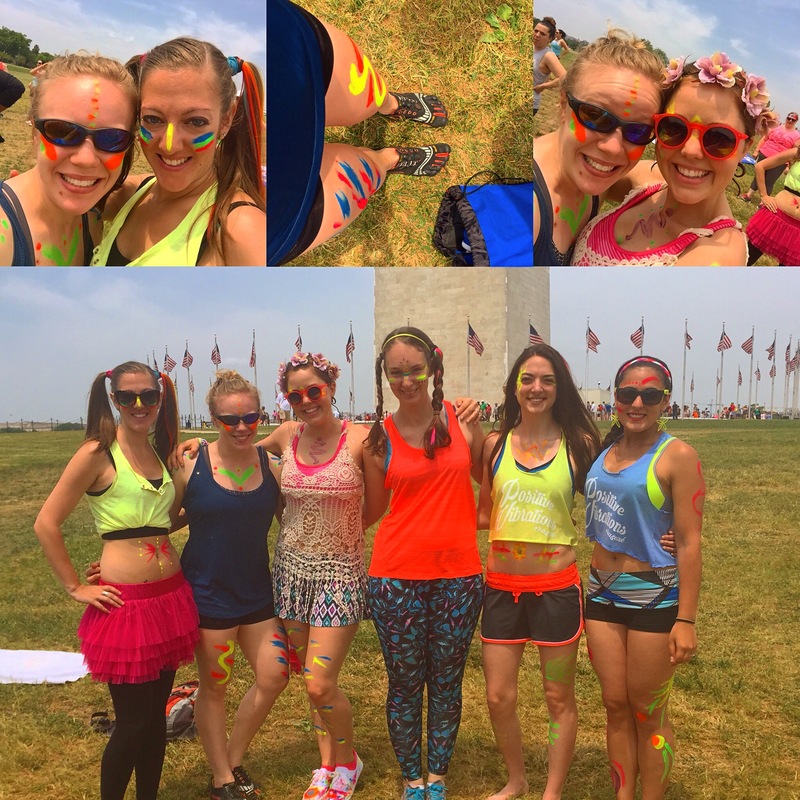 This weekend, the gals at Kazaxe held a MEGAXE – a giant dance sesh on the National Mall – to benefit the Make-A-Wish Foundation. My girlfriends and I met up at the foot of the Washington Monument to get our dance on. 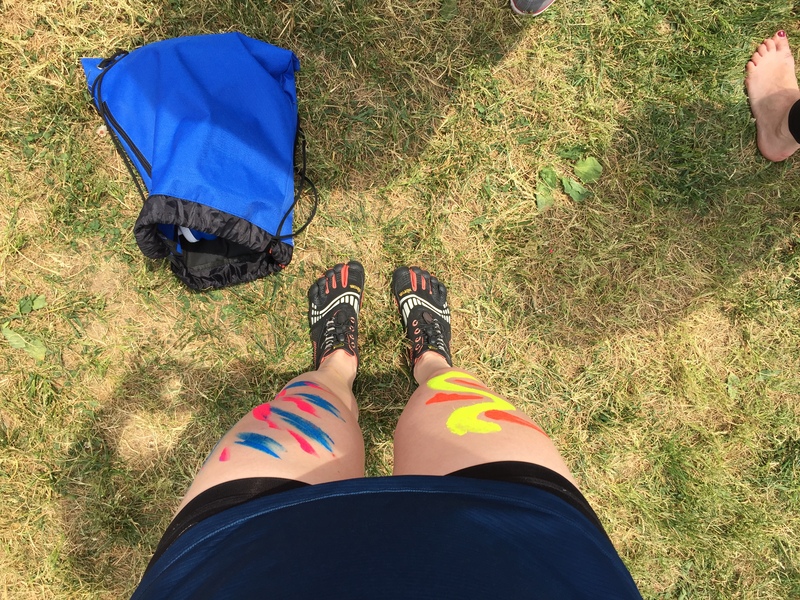 We decked ourselves out in our best warrior paint and neon and glitter – I felt like Ke$ha. It was amazing. All of the neon. All over. Everything. We got things started with a warm-up dance – and while warming up the muscles is important, we were already plenty warm. Needless to say, after one dance, the sweat? It was er’rywhere. 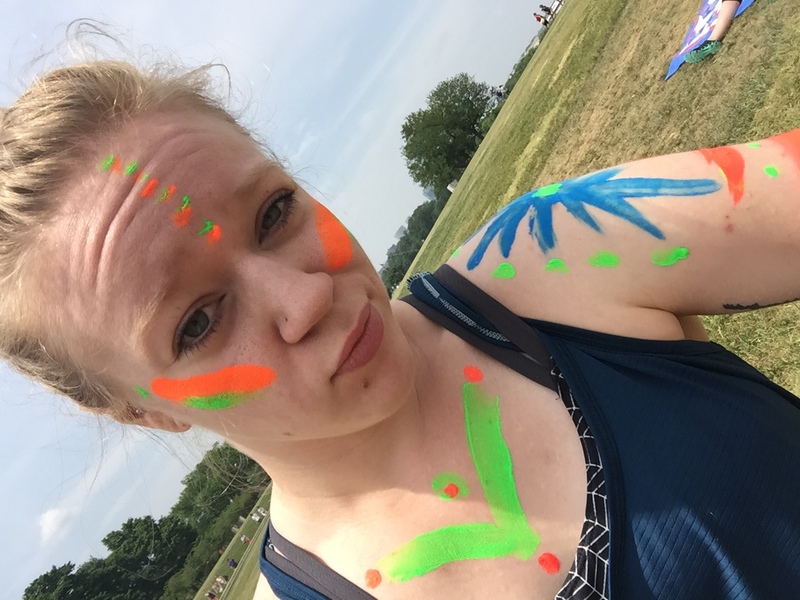 Which meant that the neon warpaint was also everywhere. This Megaxe was amazing – I’ve never been to any other workout class where I’m actively encouraged to twerk. Where twerking is part of the routine. The combination of so many styles of dance is probably my favorite part – and let me tell you, the quads? They get one helluva workout. I also love Kaza because you don’t have to be a dancer to enjoy it. Yes, the moves look kind of hard and things move really quickly, but you just jump in and do the moves the best you can. All that matters is that you’re moving and having fun. It’s nearly impossible not too. The instructors love what they do and they want to make you work. All of that dancing in the hot, hot sun meant that in about 45 minutes, I’d downed about 4 bottles of water. So necessary. I could only stay for an hour of this two-hour class, but I wore my heart rate monitor and in an hour had burned something like 900 calories. This workout is no joke. Consequently, I also wanted to eat all the things by the time I got home. Kaza is for everyone! It’s always so awesome to see so many different people get together to dance, get a good workout in, and have a ridiculous amount of fun. I don’t think we could have been smiling harder, even though we were exhausted and nearly dead. I can’t wait to get back to my next class… one of these days I’ll be able to dance like Beyonce. Some day. This entry was posted in Fun stuff, philanthropy, Uncategorized and tagged azuka bom, dance, kazaxe, megaxe, national mall, Washington DC, washington monument, work out. Bookmark the permalink. Haha. I bet you can – it’s all about finding a groove and getting down! That looks like so much fun!!! Makes me miss Zumba class.